More than 100 people gathered outside the Spokane Intermodal Center on Wednesday afternoon to protest the arrests of undocumented immigrants at the downtown transportation hub, and to call on local leaders to limit cooperation with the U.S. Border Patrol and other immigration agencies. The rally was organized by the Washington Immigrant Solidarity Network and by Planned Parenthood of Greater Washington and North Idaho. Participants decried the rising number of arrests of immigrants in the region and nationwide, including many who have committed no crimes beyond crossing the border illegally. “I have had friends – people that I’ve known for a long time – that have been arrested with no criminal record. The only crime they committed was just working without documents,” said Lili Navarrete, whose family immigrated from Mexico when she was a child and later applied for citizenship. “It took us 12 years, and we were lucky,” she said. Navarrete has lived in Spokane for 30 years and leads a Planned Parenthood program called Raíz (Spanish for “root”) that helps connect Latinx communities with health services. She said she supports the abolition of U.S. Immigration and Customs Enforcement, or ICE. Since the start of fiscal 2013, Border Patrol agents have apprehended some 200 people at the city-owned Intermodal Center, which houses the Spokane Police Department’s downtown precinct. Parts of the building are rented to Amtrak, Greyhound and other bus carriers. Agents are known to board idling buses and ask passengers for identification, arresting those who are undocumented. While the Intermodal Center is within 100 miles of the U.S. border, a zone where the Border Patrol says it can conduct warrantless searches, City Councilman Breean Beggs, who attended Wednesday’s demonstration along with Councilwoman Kate Burke, said it’s not clear that the arrests at the bus depot are appropriate. Beggs, who is also a lawyer, said council members are working on an ordinance that would prohibit immigration authorities from questioning and arresting people in public parts of the Intermodal Center without warrants. Greyhound has said it has no control over the matter and that it does not “support or coordinate” Border Patrol searches on its buses. Beggs said the city ordinance would offer clear guidance to the bus carriers and offer a potential legal defense for those who are arrested at the Intermodal Center. Many demonstrators also called for Spokane County to terminate its contract with ICE that allows the agency to house arrestees at the county jail. The facility, along with the county jail in Yakima, is a stopping point for immigrants who are arrested in Spokane and transported to the Northwest Detention Center in Tacoma. Although the Intermodal Center is publicly owned and portions of it are not reserved for private tenants, Spokane police Officer Chris Conrath, one of several officers who monitored Wednesday’s demonstration, confirmed police had prohibited the demonstration from taking place inside. He did not offer a reason. Meanwhile, Roger Hammers mounted a one-man counterdemonstration across the intersection of Sprague Avenue and Bernard Street, holding a sign that read, “Honk 4 Strong Borders.” A few passing drivers did honk, though a few rolled down their windows to cheer on the other demonstrators. He said Border Patrol agents should have just as much access to the Intermodal Center as local police, and also weighed in on the Trump administration’s discontinued policy of separating children from parents at the U.S.-Mexico border. 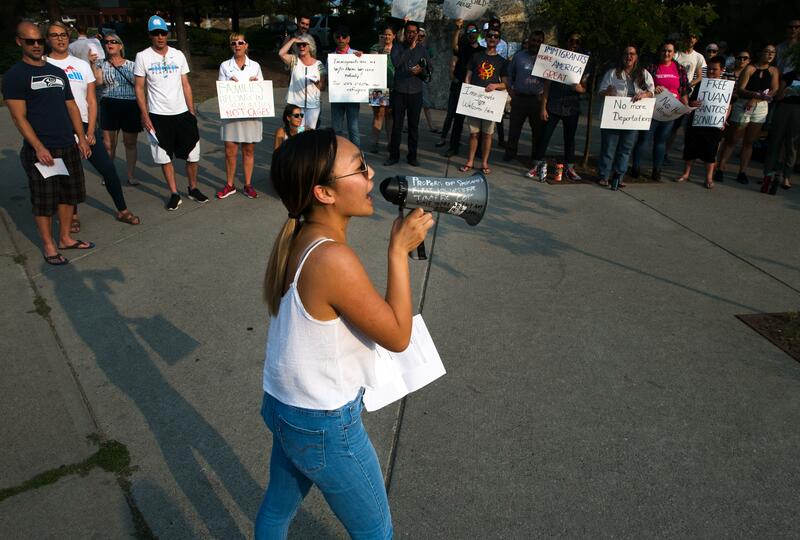 Navarrete said she and other demonstrators had received many critical and racist comments in the lead-up to Wednesday’s rally. “No human being is illegal,” she said, adding that most immigrants come to the United States to work and pursue better, safer lives.